After several delays, the Istanbul summit finally took place on Saturday, bringing together the leaders of Turkey, Russia, France and Germany to discuss peace in Syria. The four-way meeting was originally scheduled for early September, but major differences between the four led to its postponement. The sum mit brought together parties from the Astana process group (Russia, Turkey and Iran) and the Syria Working Group (the US, the UK, France, Germany, Saudi Arabia, Jordan and Egypt), but it failed to mend differences between and within each of the two groups. Apart from a very broad joint statement that emphasised the need to initiate "an inclusive, Syrian-led and Syrian-owned political process" to end the Syrian conflict, no agreement was reached on how to achieve it. The main divisive issues continue to be the political fate of Bashar al-Assad, foreign military presence, the question of the refugees and reconstruction, and the future of the Kurdish areas in the northeast. After realising its main military objectives - defeating the opposition and securing the regime of President Bashar al-Assad - Russia is trying to translate this "victory" into political gains. It seeks to normalise the situati on in Syria by focusing on reconstruction and the return of the Syrian refugees. Now, its main political objective is to convince potential donors, mainly the EU and the Gulf states, to pour money into the ailing Syrian economy and help rebuild the country. Moscow's call for the return of the refugees is quite popular in Europe and with it, the Russian leadership seeks to convince Germany - which hosts more than a million Syrians - to lead the EU into a reconstruction deal. Russia has used the refugee card before. It was deliberately targeting civilians in opposition-held areas with the aim of flooding Turkey and Europe with Syrian refugees and forcing them to reconsider their support for opposition armed groups. Refugees indeed became a key issue in European politics, contributing to the rise of popu list and ultranationalist forces across the continent. Many EU countries, including Germany, seem willing to fund reconstruction in Syria, but only after a political settlement is reached. The Syria Working Group believes that after the Russian-backed military "victory" of the regime, funding for reconstruction is the only tool left in the hands of the international community to pressure Assad and his allies to accept a political solution to the conflict. Russia, by contrast, wants reconstruction to be detached from any political process. Disagreement over this issue overshadowed the Istanbul summit, which was reflected clearly in the subsequent press conference. Russian President Vladimir Putin raised the stakes when he stated that the Sochi agreement on the demilitarised zone in Idlib province is "a temporary measure", hinting that a military option is still on the table. 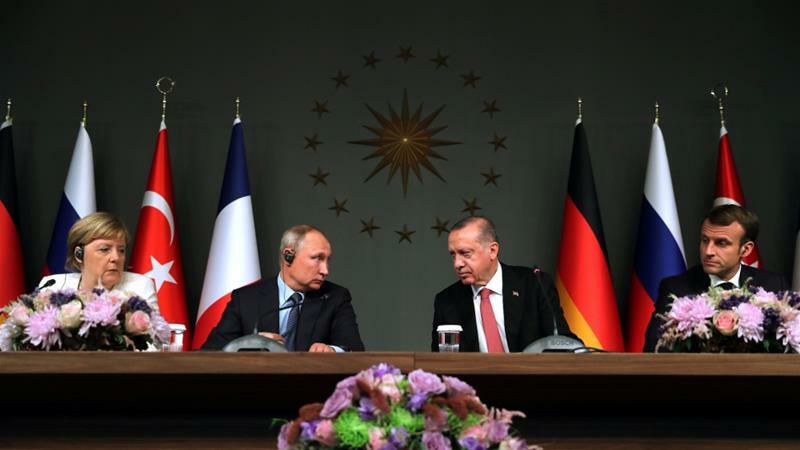 Many interpreted that statement as an implicit threat aimed at Tur key, Germany and France: If they do not go along with Russian plans, they should be prepared for three million civilians currently living in Idlib fleeing towards their borders. Putin's remarks on Idlib were also an indication that his ultimate goal in Syria is to end all foreign military presence there, including Turkish, French, and particularly the US. In early October, Putin said: "We should pursue a goal that there would be no foreign forces, [the forces] of third states in Syria at all." In fact, Russia was very disturbed by the US plans to maintain a military presence in Syria after the end of the war against the Islamic State of Iraq and the Levant (ISIL). The stated objectives of the US decision to stay in the northeast of the country were articulated in September: to preclude the resurgence of ISIL, contain Iran and prevent it from establishing a land corridor through Iraq and Syria to Lebanon, and use this military presence as a bargaining chip to force a political solution to the Syrian conflict. Today the US controls one-third of Syrian territories through its alliance with the Syrian Democratic Forces (SDF); Russia (through the Syrian regime) dominates a bit more than half of the country; and the rest is under Turkish supervision (through the Syrian opposition forces it supports). The SDF-controlled area contains 90 percent of Syria's oil and gas reserves, including al-Omar, its largest oil field, as well as most of its water resources, major dams, and power plants. The northeast is also Syria's breadbasket. As long as this area is out of its control, no government in Damascus can survive independently from foreign aid. And the Russians, who are eager to reap the economic benefit of their military intervention in Syria, do not want to and cannot provide financial aid. Hence, the withdrawal of the US forces is esse ntial for the survival of the Syrian regime and for the success of Russia's Syrian venture. Therefore, without a US-Russian agreement, there can be no significant progress made on a political solution in Syria. In this sense, the Istanbul summit was doomed to fail because the US was not there. Perhaps it was for this reason that French President Emmanuel Macron announced that on November 11 he will be hosting a US-Russia summit on Syria in Paris. The US military presence on the eastern bank of the Euphrates River is troubling for Turkey, too, but for completely different reasons. It supports and funds the SDF whose core consists of the Kurdish People's Protection Units (YPG), an affiliate of the Kurdistan Workers' Party (PKK) which has engaged in a guerrilla conflict with the Turkish government for decades. Turkey believes therefore that the continued presence of the US forces near it s southern borders with Syria empowers the Kurds and nurtures their ambitions for independence. French support for the Kurdish fighters in eastern Syria was also a bone of contention between Paris and Ankara before and during the Istanbul summit. The French have in recent months expanded their military presence in the area in support of SDF's fight against ISIL. As a sign of displeasure, Turkish intelligence disclosed the positions of the French Special Forces in SDF-controlled territories. France has also suggested that the SDF should have a seat at any constitutional committee formed to rewrite the Syrian constitution in the future, which Turkey has flatly rejected. But France and the US are not the only ones supporting the SDF's cause; Russia is also pressing Turkey to accept some kind of Kurdish representation in any political talks on the future of Syria. It is pushing for some form of decentralisation of the Syrian political system. De spite being partners in the Astana process, Russia and Turkey do not necessarily trust each other. For the past year, Ankara has watched powerlessly how Moscow used the Astana process to eliminate or expel the Syrian opposition from three of the four de-escalation zones agreed on in May 2017. Over the summer, Russia was also considering plans to invade Idlib and finish off the last remaining stronghold of the Syrian opposition. With all these different agendas, interests and objectives, it is extremely difficult to see how the main powers in the Syrian conflict can reach an agreement. In the end, even if they do, it will certainly be at the expense of the Syrian people, who appear to have no say in negotiations on the future of their country.